The center of your morning routine and the heart of your peaceful slumber make the bedroom one of the most important parts to your day. Adorn your space with a suite that reflects natural beauty, simplicity, and timeless quality with our handcrafted Siesta Mission set. 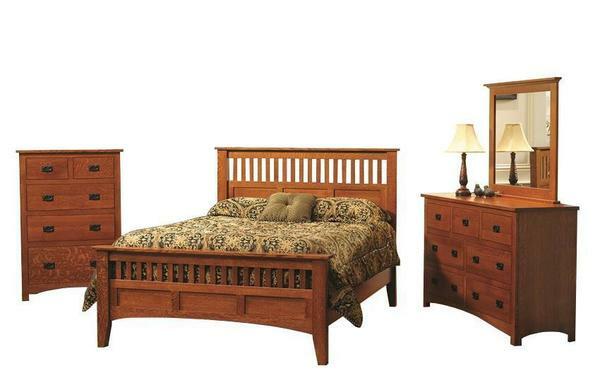 Shown in Quarter Sawn White Oak Wood with a traditional finish, this three piece set offers a sturdy bed, spacious dresser, and convenient chest of drawers to keep things tidy in your master bedroom. Each case piece offers dovetailed drawers and full-extension ball-bearing slides that allow effortless access to any item you've stored inside. Complement your collection with a matching solid-wood mirror for the dresser, optional nightstand(s) and armoire to complete a collection that will fit your unique needs. The beautiful old world construction methods and solid wood used ensure a lifetime of service that can be handed down and enjoyed for many generations to come. Also available in Cherry, choose the wood and finish of your choice to match your decor and your new suite will be handcrafted just for you - allowing you to start a family legacy with the natural beauty and elegance of fine, solid wood American furniture. Call 866-272-6773 today if you have any questions or if you would like help placing your order. Our fully staffed team of Amish Furniture Specialists will be happy to assist you in any way that they can! Thank you for choosing DutchCrafters Amish Furniture for all of your Amish bedroom furniture needs. Floor to Top of Side Rails Height: 14 5/8"